This interview originally appeared on The Rabbit Room. Real Love for Real Life is not only a beautifully-crafted exploration of the calling of caregiving, it is a gift of care in itself. Andi Ashworth writes with great compassion and great humility, and the result is a book that will literally change lives and give souls courage to dwell in Christ’s love in concrete, practical ways. Andi’s perspective is refreshing and rare, in the way that all good, old, true things are: a voice of affirmation to an often-overlooked and sadly neglected part of the body of Christ, and a loving challenge to a generation that seems characterized by isolation, busyness, and hurry. Andi is such an inspiration, a genuine example of a lifestyle of love. It was my great privilege to ask her a few questions on the occasion of the release of the Rabbit Room Press edition of her timeless–and timely–book. 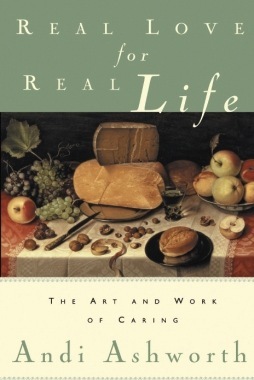 Lanier: In your book, you paint a picture of caring as a unique and legitimate vocation, encompassing a limitless spectrum of opportunities for expressing love in practical ways. People tend to think of caregiving as specific to the needs of the helpless — the sick, the dying, or very small children — and while you honor these special cases as sacred and necessary, you cast a vision that goes beyond them, embracing the daily occasions of a lifetime. You point out, however, with great compassion, that the calling of caregiving is one that receives very little outward validation in our day and age, particularly as more and more of the details of our daily lives are outsourced to “professionals.” To the ones called to love in such concrete, often mundane, ways, your words are wine to the soul, a much-needed voice of affirmation amid a wilderness of hurry and efficiency and convenience. In the ten years since you first wrote such life-giving words, would you say that the attitudes within the Church have changed towards caregiving as a valid calling? If so, how? What are some of the things that you would say to encourage this generation to consider the vocation of caring, or to help individuals recognize it as a calling in their own lives? Andi: There is small and steady progress with the Church’s understanding of the nature of vocation. Organizations like The Washington Institute for Faith, Vocation, and Culture do a huge service by helping people fully understand the meaning and mission of vocation. But in the general church culture, as in the larger society, there is one big issue that gets in the way of a full comprehension of caregiving work and vocation. Work continues to be largely understood only in terms of a work/compensation model. And most of the caregiving that takes place in everyday life is not paid labor. The mother or father caring full-time for children and family life, the homemaker creating a home that’s interesting, alive and welcoming, the person who’s always meeting the practical needs of neighbors and friends, the work of hospitality . . . there are a million different versions of what caregiving can look like. It’s hard work and it’s creative work, but so much of it takes place behind closed doors or without much fanfare. The results are seen, felt, and enjoyed by others, but it’s rare for folks to really notice or think about the labor that went on behind the scenes. Biblically speaking, work has an intrinsic value of its own when it’s carried out to satisfy genuine need. The value of someone’s work has nothing to do with whether or not it has a paycheck attached to it. It’s crucial for caregivers to understand this, to learn a holistic theology of work, to know their labor matters to God and to the flourishing of families and societies. Everyone needs to know their work matters. It’s very wearying to feel invisible to the world or to the people in your own household. But if you can latch on to the truth that caring for human life is a very powerful work that actually changes the shape of people’s lives and the way they experience the world, you will have a vision that can hold you even in the midst of dismissive cultural attitudes. Real Love for Real Life was born out of my own need to understand all these things. It’s a very personal book, full of stories. It was also very important to me to write about the imaginative, creative, and artful side of caregiving. Van Gogh said something like this: “The highest form of art is fashioning human lives.” I’m not sure if that’s the exact quote, but it’s certainly true. You’re creating all the time — creating a mood, creating a meal, making a sick person comfortable, creating a celebration, nurturing compassion, creating a welcome — you’re always making. When our imaginations are captured by the idea of creating good stories in the lives of the people we’ve been given to love, a world of possibility opens up. It must be said that a lot of caregiving work is tedious, repetitive, and wearying. Washing endless loads of laundry, a thousand trips to the grocery store, cleaning up after children, all the bits and pieces required to care for a spouse or friend who’s battling illness. But if we can keep in mind the bigger story we’re creating, it goes a long way in bringing meaning to the details. If you are someone who’s drawn to respond to human need in practical, creative ways, take it seriously and live it out faithfully. The world is desperately in need of people who are gifted and called in this way. L: You place a great emphasis on recognizing individual gifts as clues to opportunities for service in the body of Christ. How did you come to such a clear and tailored sense of your calling, especially in a world that is constantly shouting at us to “do it all”? Can you elaborate on how you have learned to say “no” to good things that simply don’t line up with your personal calling? A: For many years, because we were a self-employed music-business family, I did a lot of work that was necessary — accounting and administrative stuff — but that I had no natural ability for. As time went on I was increasingly frustrated spending my days working in an area I was not drawn to, not gifted for, and would never have chosen had it not been connected to my husband and our family income. At the point of my highest frustration, about sixteen years ago, I took a class from a counselor that changed my whole way of thinking and living. For the ﬁrst time ever, I considered my personality type, my gifts, the settings I preferred to work in, the tools I like to use, ﬁelds of knowledge I already had and others I would like to pursue. I thought about the things I love to do and will always do in some capacity because they are integral to who I am. I began to understand that those things are inside me because God has put them there and I’d be wise to pay attention. For one thing, I realized I’m a writer and began to pursue that seriously. And I started looking at my life in other ways to see what it was telling me. My journals helped me see that caregiving was huge and continual. We had a constant stream of people coming through our home, the Art House, and I was taking care of them all in one way or another, so the caregiving included our children and family, but it was much more than that. Once I had the tools to think about vocation, I could see that I was good at caring for people and that I’d been inclined that way since I was a young girl. I was naturally nurturing, but I’d also learned through response, experience, and study. I had skill in cooking, listening and staying at the table with people who needed to talk, giving counsel and speaking honestly about my own life, anticipating need, creating beauty in our environment — really all kinds of things I’d never thought of as being anything special, but in fact they were. They were exactly what was needed in the life God had given us. I’ve been so grateful to have navigational tools as my responsibilities have expanded into other areas, but caregiving in different forms continues on. The more I can name my callings, I am free to say “no” to things that are not mine to do. I can trust God to provide someone else. I am now more inner-driven than outer-driven. Naming the different parts of my vocation isn’t something I did over a decade ago and never had to do again. Chuck and I do it all the time. Periodically we take stock of our individual and shared callings because they shift and change, the shape of our family changes, and our own needs change. It’s really important to know what our work requires of us at any given time, not to mention caring for our marriage and our bodies. And understanding the relational aspect of calling is crucial — that we’re most responsible inside our circle of immediate and extended family and close friendships. Requests are coming at us all the time and there’s no possibility of keeping up with everyone, so there has to be a way to navigate. The unanswered emails, Facebook messages, and phone calls often feel like failure, but we know we’re not without limits. We have to have an order of priority and ultimately live before the Audience of One. Everyone does. We’re all capable of trying to split ourselves in so many pieces that we don’t end up being any good to anyone. L: I love the fact that you and your husband have evaluated your calling as a couple, and have made such intentional choices in accordance with your vision for home and family and the ministry that can take place within these contexts. What are some of the ways that you complement each other in this shared life, and how do your personal vocations enhance those of your marriage? A: My husband, Charlie Peacock, is a very gifted musician, songwriter, record producer, entrepreneur, thinker, writer, speaker . . . the list goes on and on. It’s not really fair for one person to be good at so many things, but there it is! He’s wired to thrive in complexity and loves to juggle many things at the same time. I have to juggle too, but when it comes to writing, creating a talk, or preparing to host the occasional large event in our home — when there’s something attached to a deadline — I need space to concentrate and pour myself in. I need to focus on that one thing as much as possible. My husband, on the other hand, can write a book while other people are in the room! He learned that kind of focus when we had small children. He would sit at the piano and work on songs while the kids were noisy and playing in the same room because music was our bread and butter. We didn’t have any other place for him to go to be alone. I, on the other hand, have to tune all the way in to the people in the room. It’s the way I’m made, and it’s also been necessary for the life we’ve had. We’re different in many other ways, too. He makes quick decisions. I’m a processor. He’s an improviser. I’m a preparer. We’ve come to understand over all our years together that our two very different kinds of wiring are actually very complementary. One style is not better than the other, just different. Our life has needed both. So our styles are different, but we have many, many shared concerns. Place is very important to us. A life of the mind is important. Ideas are important. People are important. We live and work in a century-old renovated country church where our recording studio, offices, and home all string together. We’ve been making things and serving people from this place for many years. We partner in the work of Art House America, a non-profit committed to the encouragement of imagination and creativity for the common good. A lot of that work has been hospitality-based, but it’s changing. We can’t invite the world into our home anymore in the same ways we always have. But we now have a virtual Art House, a blog where we publish essays that reflect Art House America cares, concerns, and joys. I work closely with our editor, Jenni Simmons, to have a hospitable blog that offers a wide range of topic areas — Creation Care, Artful Children, Feast, Music, Visual Art, Bookish, and much more. A change like that — shifting focus from our place to the blog — is healthy for our marriage at this stage. I still love meeting with individual people, which I do often, but right now I really care about creating a blog that educates, inspires, and goes way beyond our front door. And Chuck has a very heavy production schedule, so he’s not as available these days either. After 37 years of marriage we are more sensitive to each other’s needs personally and vocationally than we’ve ever been. We’re shifting accordingly, and that is key to a good marriage and a fruitful life. L: One of the things that is especially refreshing about your perspective on caregiving as a calling is the gentle reminder of our human limitations. You have a lot to say about the needs of the caregiver and the necessity of receiving care as gracefully as we give it. What are some of the ways that you have learned to recognize your own needs and boundaries? What are some of the practical ways that you replenish your own wells of creativity and artistic giving? A: Hospitality has taught me about my limitations probably more than anything else. A hospitality vocation makes for a rich life full of treasured relationships and involvement in people’s lives. But I’ve had many seasons of being so completely burned out by always having people around and not having privacy, I felt I would internally combust. I am an introvert, and so is my husband. We were in our early forties before we learned the true meaning of introvert/extrovert. It was a revolutionary bit of information. I am highly relational, but I also need a lot of alone time and private space to reenergize and be with people again. When we began to understand our needs, we made adjustments. And we’ve been making adjustments ever since — everything from small tweaks to large changes. We made a huge change just this year. At the end of 2011 we both decided that our life of having people stay with us so often was at an end. We’d been at it for thirty years, with increasing intensity over the last twenty. But we’re in a different season now. In addition to what I’ve already talked about, we have five grandkids and will soon be adding to that number. Our daughter and son-in-law are several years into an international adoption process and we eagerly await the arrival of our newest grandchild, whenever it happens. We want to be present with all these little ones. So as much as we value hospitality and will always maintain that kind of life in some way, we’re drawing the line at overnight guests as much as we can. Aging is helping me pay attention to a healthier way of living. At 56 years old I have to take care of my body and conserve my energy for the things I’m called to now. I’m more aware than ever that I can’t push and push beyond my mental or physical energy, so I’m trying to be wise and take care of myself. Regarding practical ways to replenish, I’m walking and swimming multiple times a week and trying to eat well consistently. I’m newly in touch with my garden in a way I haven’t been in years. I planted garden spaces all around our property, and then got too busy to take care of them. I still have help with maintenance, but this year I’ve had my own hands in the dirt — planting, weeding, and deadheading. It’s very nourishing to me to be a part of creating beauty outdoors. I read a lot. Well-written books are huge in my life. Literary novels and memoir are important. Cookbooks are necessary and inspiring. I read the Bible for food and breath and life, always. I write in my journal often. If I get to go the beach once a year, I’m a happy girl. I love bike riding when I’m in California visiting family. The beauty of sacrificial behavior inspires me. Greatness in visual art, literature, music, theater, and film feeds my mind and soul. A wonderful connecting conversation with a friend does, too. Every now and then we get to go to Laity Lodge, which is a retreat center in the hill country of Texas. We usually go there to work in some way — to be a part of the speaking team or for Chuck to play music. But I always come away refreshed in body, mind, and spirit when I’m there. The setting in the Frio River Canyon, the hospitality, the food, the people, the caliber of teaching and music and art making, and the restful schedule all serve to make Laity Lodge one of the most special places I know. It’s not often that you can go somewhere to be a part of the work but come away refreshed and inspired. L: It is significant to me that you focus more on the concept of celebrating the ceremonies of life, seeing them as chances to anchor your loved ones in tangible experiences of love, rather than merely holding up traditions. How do you live in harmony with the changing seasons of your life, while still maintaining such a strong sense of family connectedness and continuity? A: I want to leave my family with a heritage of memories and a strong sense of belonging. It was important when my kids were growing up, and it only gets more important as grandchildren have come into the picture. I think I’m more in tune to this longing because my parents divorced when I was very small, and the most anchoring experiences I had were with my maternal grandmother. My dad was hardly in my life at all. My mom was very much in my life, but died when I was a young woman. So I’ve often felt rather rootless in regards to family of origin. By the time I was old enough to care about where I came from and ask questions, my mother and all my grandparents were gone. One of my aunt’s, my dad’s sister, has been really generous about passing on family information, but on my mom’s side I don’t have much. So I probably overcompensate by saving every scrap of paper someone generates in our family, keeping loads of journals, and wanting to do what I can while I’m around. I want to leave a trail of experiences, recipes, photographs, and stories that communicate love, belonging, and family history. In the first years of our marriage, Chuck and I came very close to not making it. When the grace of God came to find us after we’d been married for seven years, we learned to be intentional about creating in family life and having stories to call our own. I guess in one way or another we’ve been doing it ever since, only now with the help of our grown children. When our kids were growing up we didn’t have a lot of continuity surrounding major celebrations like Christmas. For one reason and another we couldn’t keep things the same every year. But we found our way into different traditions. We made a big deal of Valentine’s Day, making it a celebration of the love within our little foursome instead of something only for Chuck and me. For ten years, until our daughter, Molly, left for college, we wrote letters to each other and read them aloud after a sharing a special dinner. I have the letters in a scrapbook. Once in a while I’ll get them out and read them again, crying every time, especially with the last batch! With grandkids, we have rituals and traditions — dances under the disco ball in our living room, cooking together, decorating Christmas cookies with the whole family, playing games in the car that Chuck creates on the spot! For little kids, even the smallest rituals have meaning because it’s all about continuity and sharing something together. My first granddaughter and I even have a tradition of making the coffee together whenever she spends the night. We started it when she was a toddler and she’s now eight. When she was tiny she sat on the kitchen counter while I rinsed out the coffee maker and filled it back up with water. Then we opened the jar of coffee beans, smelled the rich aroma of good coffee, poured it in the grinder, ground the beans while she counted to ten, put the coffee in the coffee filter, placed everything back on the coffee maker, and she would push the “on” button. At eight years old she can do most of this by herself. But everything must be done in the proper order and we never skip the step of sniffing the beans and commenting on how good they smell. In the whole scheme of things this is very small, but it belongs only to the two of us, and I bet she’ll remember it when she grows up! A long time ago, I heard my friend Nita Andrews say something profound and beautiful. I wrote her words in my journal: “rituals and traditions become our interior secret, something of time, place, and history. They are patterns of beauty that we can create, and our people will keep them as the place of their heart, the place that they came from.” I believe this, and I want it for the ones I love. L: How has the acknowledgement of caregiving as both an act of worship and an art form impacted your personal relationship with Christ? A: I love what William Barclay has written: “Real worship is the offering of everyday life to him, not something transacted in a church, but something which sees the whole world as the temple of God.” Worship does happen in the gathering of the Church, of course. But one of the beauties of the Christian faith is that we can also worship him through our ordinary, daily lives, even when we’re not aware of it. Since the love of God and love of people are intertwined, there is great meaning in the thousands of ways faith can express itself through love in an individual life. Matthew 25 says that when we feed the hungry, give clothes to people who need them, care for the sick, give drinks of water to thirsty people, visit shut-ins, and welcome strangers, we’re actually serving Christ himself. This scripture has a very wide application, but I try not to miss what it means in my own life as I feed hungry people around my table, give drinks of water to my grandchildren, or welcome strangers into my home. The message is clear that even the smallest act of caring for another human being in a life-giving way is an enormous expression of love to God himself. It’s about meeting human need where we find it, and we find it in the life God gives us. I also know that going after beauty is the right thing to do. It’s such an obvious thing to say that beauty matters to God, but it’s true. It’s also true that people are cared for through beauty. So when I do even the smallest things to bring beauty into our life, arranging a vase of flowers from the garden or ironing a beautiful vintage tablecloth for the kitchen table, I feel the pleasure of it and the rightness of it. How could I not love a God like this, who is sovereign over every square inch of the universe, and yet whose love and involvement brings meaning to even the smallest details of my life? Everything matters, and so I run to him with every need, every gratitude, every desire, every heartache, and every hope. L: Andi, thank you so much the gift of your time and your words, both here and in your book. I know that they will bear God’s grace to many, in the giving and receiving of care in His name. The new Rabbit Room Press edition of Real Love for Real Life is available in the Rabbit Room store.